I opened my private practice in Spiritual Counselling six years ago, although my passion, experiences and teachings in spirituality go all the way to my childhood. I also work as an occasional teacher in the Elementary and Secondary Catholic schools in Ottawa, introducing "Tapping In Schools" program and providing students with spiritual workshops and teachings. Over the years I have been trained in Reiki, hypnotherapy, angelic communication, meditation, SPHE-RE energy healing, EFT & intuition. I am offering you a warm, safe, and comfortable opportunity to talk about what has been inside of you for such a long time. I will be there with you, supporting you, as you delve into the emotions that are there to be expressed and cried out if need be. Using various healing techniques, I focus on getting you to the core, healing the issues, cleaning up, and getting on with your life. Most of my clients find dramatic relief and improvement on the issues they come for with 1 to 4 sessions (see testimonials). While I have found value and inspiring messages in many world religions and teachings, I was divinely inspired to create 'Jesus Speaks Cards' which reflect on the positive, uplifting messages at the core of Jesus's teachings. 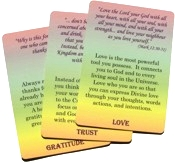 The cards are meant to assist you to truly bring healing and inspiration for every soul of all denominations. It is my gift to the world and a complementary gift for each client.